This past offseason Dallas hired Academy Director Luchi Gonzalez as the teams new head coach and Oscar Pareja’s replacement. Gonzalez was commissioned with the task of integrating the organization’s youth with the first team. This is a rather fitting assignment since over the last three years Gonzalez was, as mentioned, the Academy Director. Obviously Gonzalez is going to be the one who best knows what Dallas has in terms of young talent, and how to find a tactical style that best fits their pieces. He’s brought with him fresh tactics to incorporate the young talented players, and he comes at a time when Dallas needed a twist to their first team’s style. The departure of Mauro Diaz, the little unicorn, has caused consternation in how the attack operated after his transfer and lead to issues of its own last summer. For years I’ve been interested in how players contribute to team results. I’ve sought a measure of player contributions to a win that covered all aspects of a game. While many valuable and informative soccer metrics have been created, common stats are not entirely on point with this issue. For example, xG stats apply only to scoring attempts, and perhaps goalkeepers. Adding xAssists and key passes broadens the scope of included players. But the contribution of defensive oriented players would not be expected to show up on these metrics. And offensive-oriented players would still rely on teammates to threaten the net before their effort can be measured. The xGChain metric is useful for identifying players that participate in the most productive attacks, and includes players that play further away from the goal. But this metric does not include non-offensive actions. And each players’ contribution is given equal weight, whether it’s the initial square pass to a CB in the defensive half, or delivering a cross into the penalty area. Experienced analysts consider the dashboard of key performance indicators and piece together insights from the elements. But I’m looking to consolidate all game elements with a common perspective. A few days ago, Matt Doyle (aka the Armchair Analyst) called our attention once again to the amazing things that Darlington Nagbe does with a soccer ball. Nagbe has the ability to do the sorts of things that great players often do. Those miraculous moments that freeze time and leave you wonder struck. Last year it seemed like there were fewer of those moments than in years past. But as Doyle pointed, though it's early, Nagbe looks to be headed in the right direction. By raw usage, he looks the same as always (about 10.5%). Usage is measured in touches divided by team touches. 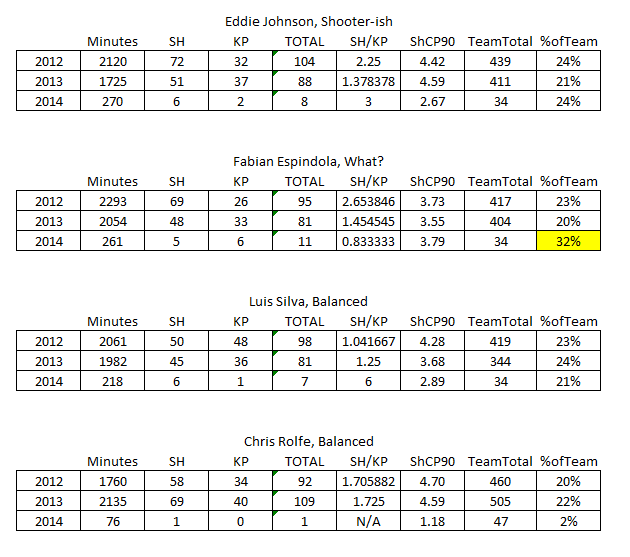 But as a proportion, his touches have led to either him taking more shots or his teammates taking more shots. So while he's touching the ball about as much, his touches are more dangerous. Looking at the shots he creates per pass, we really see the meat and potatoes of Nagbe's growth and influence. In 2014, his shots created (shots + key passes) represented just 2.4 percent of his total passes. Now, we're seeing that ratio up closer to eight percent. This is pretty significant if you look at the the company he's enters. He is contributing to the attack thus far in 2015 at a Graham Zusi/Federico Higuian level, rather than hanging around in Harry Shipp/Dillon Powers. 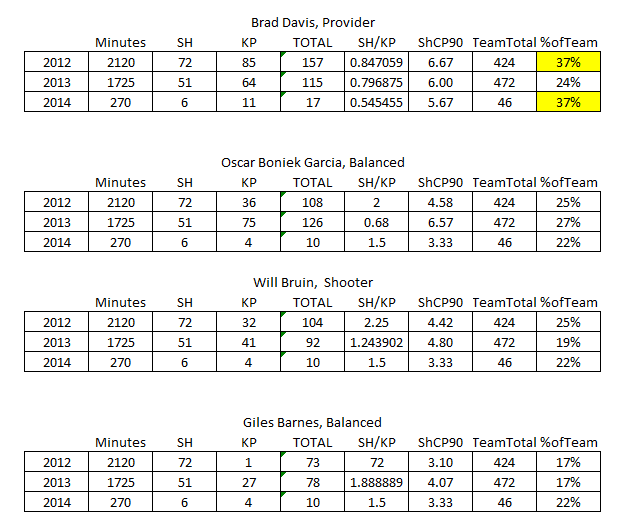 This isn't to say that Shipp or Powers aren't good players. They are, and the majority of MLS teams would been keen to get their hands on either of them, but they aren't great, game-changing talents. This feels like the first time Nagbe's numbers actually corroborate the skill that he shows on a weekly basis out on the pitch. With all the requisite warnings about sample size, it might just be that Nagbe is finally entering into that next tier of player, a moment that has been much anticpated by many Timbers fans and pundits a like. When a car breaks down, a mechanic's job is to tell you what caused the failure. He or she can generally pinpoint the problem to a specific part reaching the end of its useful life. But have you ever asked a mechanic why your car is working fine? Or which part deserves the most credit for your car running smoothly? Of course not. That would be a waste of everyone's time. There are many parts to a car and all are doing their job as designed. We never ask why when things are going well. The same dilemma exists in assessing soccer defenders. After all, most of how we assess defenders has to do with what goals were not scored. And when all the parts of the defenses are working as designed, goals are avoided. But which defenders deserve the credit when goals aren't scored? It's like the pointless car question, which parts of the car deserve the most credit when the car runs smoothly? To even begin this conversation we need to take stock of what data exists for soccer defenders. And just to be clear, I am going to steer clear looking at a defender's offensive capability. I want to focus solely on defensive statistics. Whoscored is the only site that offers a collection of defensive statistics, and here is what they have and their definitions. These are the defensive-oriented statistics offered by Whoscored that are tracked at the individual player level. Of course, the other vital defensive statistic is shots conceded but those can't be attributed to any one player. So then, do any of these statistics matter? First there are a couple of assumptions to iron out. A defender should be judged by the rate at which he accumulates statistics. So to get to that number we need to adjust these statistics to account for the time that the opponent has the ball. For example, Player A who averages 5 clearances per game might be better than Player B who averages 6 clearances if Player A's opposition had the ball 20% less often. That would mean player A made more clearances given the opportunities provided to him. So I will adjust all metrics by opposition possession. Since I am trying to assess what goals are not scored, I going to look at the numbers at the team level first. It is only at the team level that goals can be attributed. After that analysis I will attempt to attribute value to the individual metrics. Here are tackles per game per minute of opponent possession against goals scored. 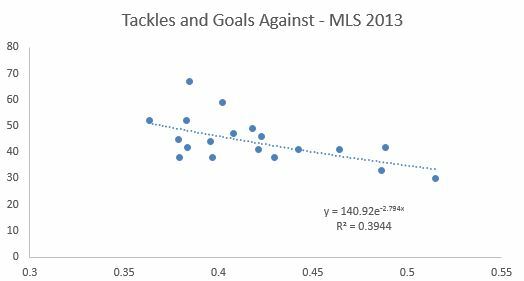 Tackles represents the strongest correlation of all the variables. In fact, tackles has a slightly stronger correlation to goals against than shots conceded. Here is a look at the shots conceded as a percent of opponent minute of possession. The two points to the far left represent the LA Galaxy and Sporting Kansas City. They appear adept at limiting shots on goal per minute of opposition possession. They also stand out when looking at offsides won. Rather than show every graph, here is a table of the defensive statistics, their level of impact and the R squared of the impact in predicting goals against. Offsides won is the most impactful of the statistics (has the greatest slope) but there is a weaker correlation than Tackles or Clearances--in other words, there are greater deviations from the trend line. It's interesting to see that Blocks as a percent of shots has almost no impact on goals allowed. This is interesting, but what to make of it all? In an ideal world we could compile these statistics into a meaningful metric in order to compare players. The most obvious way to do that statistically would be to run a multivariate regression using all of the statistics. The trouble with the result is that the statistics end up not being statistically significant predictors when mashed together. So developing a score from these metrics would be a bit of a fool's errand. The other option would be to ignore the predictive strength of the variables and just use the goals avoided results as a scalar, multiply them by each player's statistics, add them up and compile a score. In this case the resulting score would be something we relate to as we could say that this player avoids x number of goals per game. However, this would give offsides won the statistic with the greatest importance despite the fact that the correlation is not strong. To factor in the correlation we could leave the realm of sound statistical practice. We could multiply the goals avoided scalar by the R square. We could turn that into an index with the highest metric (tackles) equaling 1. If we did that here is the resulting table and values for each metric. Tackles would be the most important statistic followed by offsides won and then clearances and interceptions. It turns out blocked shots have no material value in estimating goals against. Before I use these numbers to reveal the top 10 MLS defenders, here are the caveats. Obviously this ranking is missing a few vital elements of defending in soccer. The first major omission is positioning. Often a defender being in the right position forces an offense to not make a pass that would increase their chance of scoring. There is no measurement for that but obviously a defender out of position is not a valuable defender. Clearances, interceptions, tackles and offsides won are clearing indicators that the player was probably in position to make the play and they indicate the player succeeding making the necessary play. But offensive attempts avoided are clearly missing. The other major omission is the offensive play of the defender. A defender who defends well and represents an offensive threat is that much more valuable. But I'm not trying to solve for that here. I leave that for the subject of another post to integrate passing and offensive numbers to build a better score for defenders. Here are the top 10 MLS defenders based on the score developed through the last week for players with a minimum of four appearances. I find it comforting that, for a new metric, Jose' Goncalves, MLS Defender of the Year in 2013, tops the list. There's a big drop between the top 2 defenders and Paparatto. There's also another cliff after Andrew Farrell. But hey, it's a start. I hope this was an enlightening ride through the mechanics of defending from a soccer perspective. The next time you're watching a game, don't just focus on the breakdowns. Also look for what makes the defense successful. Many of the features listed below from our shot-by-shot data for 2013 and 2014 can be found above by hovering over the "Expected Goals 2.0" link. Last month, I wrote an article explaining our method for calculating Expected Goals 1.0, based only on the six shot locations. Now, we have updated our methods with the cool, new, sleek Expected Goals 2.0. Recall that in calculating expected goals, the point is to use shot data to effectively suggest how many goals a team or player "should have scored." This gives us an idea of how typical teams and players finish, given certain types of opportunities, and then allows us to predict how they might do in the future. Using shot locations, if teams are getting a lot of shots from, say, zone 2 (the area around the penalty spot), then they should be scoring a lot of goals. Now, in the 2.0 version, it's not only about shot location. It's also about whether or not shots are being taken with the head or the foot, and whether or not they come from corner kicks. Data from the 2013 season suggest that not only are header and corner kick shot totals predictive of themselves (stable metrics), but they also lead to lower finishing rates. Thus, teams that fare exceptionally well or poorly in these categories will now see changes in their Expected Goals metrics. Example: In 2013, Portland took a low percentage of its total shots as headers (15.4%), as well as a low percentage of its total shots from corner kicks (12.3%). 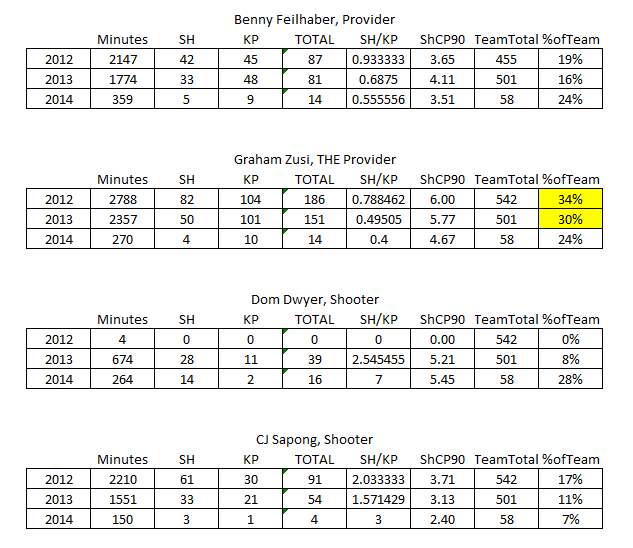 Conversely, it allowed higher percentages of those types of shots to its opponents (19.2% and 15.0%, respectively). 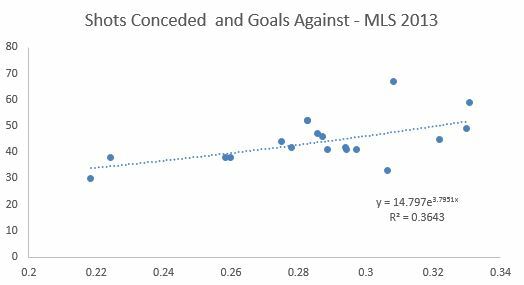 Presumably, the Timbers' style of play encourages this behavior, and this is why the 2.0 version of Expected Goal Differential (xGD) liked the Timbers more so than the 1.0 version. We also calculate Expected Goals 2.0 contextually--specifically during times periods of an even score (even gamestate)--for your loin-tickling pleasure. Another addition from the new data we have is that we can assess players' finishing ability while controlling for the various types of shots. Players' goal totals can be compared to their Expected Goals totals in an attempt to quantify their finishing ability. Finishing is still a controversial topic, but it's this type of data that will help us to separate out good and bad finishers, if those distinctions even exist. Even if finishing is not a repeatable skill, players with consistently high Expected Goals totals may be seen as players that get themselves into dangerous positions on the pitch--perhaps a skill in its own right. The other primary player influencing any shot is the main guy trying to stop it, the goalkeeper. This data will someday soon be used to assess goalkeepers' saving abilities, based on the types of shot taken (location, run of play, body part), how well the shot was placed in the goal mouth, and whether the keeper gave up a dangerous rebound. Thus for keepers we will have goals allowed versus expected goals allowed. Win Expectancy is something that exists for both Major League Baseball and the National Football League, and we are now introducing it here for Major League Soccer. When the away team takes the lead in the first 15 minutes, what does that mean for their chances of winning? These are the questions that can be answered by looking at past games in which a similar scenario unfolded. We will keep Win Expectancy charts updated based on 2013 and 2014 data. In the wake of Major League Baseball awarding its MVP to Miguel Cabrera, debates over what "valuable" means have once again flared up. Though soccer and baseball are two incredibly different sports, I think we can apply some of the same logic to both MVP discussions. Major League Soccer has about two weeks remaining before its MVP award is handed out, and we will no doubt encounter many of the same controversies in the soccer blogosphere that appear in baseball every season. The MVP controversy usually begins with what "valuable" means. I think there's little doubt in most people's minds that "valuable" and "skilled" are correlated. The main controversy is how correlated. To some, asking who was the best player in Major League Soccer in 2013 would be equivalent to asking who was the most valuable to his team. To others, there would be some key distinctions, the most common of which is that MVPs must come from teams that reach the post season. "We each want to buy something that costs $1. I’ve got a quarter, 8 nickels, and 10 pennies. My 'team' of coins is worth 75 cents and falls short of being able to buy the item. You have one dime and 18 nickels. Your 'team' is worth $1, and you successfully buy the item. Is your dime more valuable than my quarter simply because it led to a successful item purchase?" Mike Trout = quarter and Miguel Cabrera = dime, for those of you not so into baseball, and the question is a good one. Few would argue that the dime is more valuable than the quarter just because it found itself in a position to help buy that scrumptious Twix. "Except not everything costs $1, and at any rate, you would always choose the quarter over the dime when accumulating money for a purchase." "Especially when you don’t know the cost of the items until you get to the store. In baseball, a team cannot be sure how many wins it will take to reach the playoffs until the last day of the season. In your example, the quarter is the most valuable piece regardless of whether or not the item cost $1 or $0.75." When thinking about attributing value to players like Marco Di Vaio, Mike Magee, Camilo Sanvezzo, Robbie Keane and company, why should it matter where their teams finished? If one believes that Magee, for instance, is the best player in MLS, then does it matter if he took his team from 39 points to 49, versus from 40 points to 50? Either way, it's still ten points of value in the standings. When Magee was traded to Chicago, neither Chicago nor Magee knew that the Fire was going to need 50 points to make the playoffs. The fact that they got just 49 points shouldn't negate any of Magee's value. If you say that it matters because MLS clubs get real value from extra playoff games, then think about this. Playoff cutoff lines are quite arbitrary. If MLS allowed only the top two teams in from each conference---not completely unreasonable for a league of just 19 teams---then none of the players mentioned above would be considered under this playoffs requirement. Playoffs represent an arbitrary bar that the players competing for the award don't get to set, and while reaching the playoffs does bring the team measurable revenue and value, basing an award on something outside an individual's control would, in my opinion, strip the award of its intended meaning and purpose. Now let's anticipate the logical counterargument---that players pick up their games in playoff races and play well when it matters most. For a moment, let's ignore the fact that little evidence has ever been found in professional sports that players can turn it on and turn it off as needed. This past season, Magee scored seven goals in Chicago's final nine games, a stretch in which the team averaged 1.56 points per match. That represents a pace that would have gotten the Fire into the playoffs if maintained for the entire season. Di Vaio scored five goals in his last 10 games---I even included that tenth-to-last game in which he scored two goals---in a stretch where Montreal tallied just 0.7 points per match, limping into the playoffs on a tie-breaker with Chicago. Just because one team makes the playoffs doesn't mean its best player was at his peak when it mattered. Goals are, admittedly, a narrow-minded way to measure a striker's value, but I think the point is still valid. For me, the Magee-Di Vaio example above may have been no more than an exercise in confirmation bias. I chose to see what I already believed. However, the logic behind the belief that team standings shouldn't matter to players' MVP merits is still good stuff, and transcends any biased example I can come up with. If we're ready to agree that that the MVP award should essentially be given to the best overall player, then we still have a tall task ahead of us. How do we measure skill on the soccer field? That is the 64,000-dollar question, and one we hope to help tackle here at ASA some day. But perhaps it's not so crazy to think that a guy like Federico Higuain is deserving of the MVP award. If you scoff at that notion, you likely do so because you've been trained to think about MVP awards in a certain way. We're all about re-thinking things around here.